German volunteering soldiers wore protective equipment as they took part in an intensive course to prepare volunteer helpers for their deployment in Ebola-hit countries. GALVESTON, Texas — Almost a decade ago, scientists from Canada and the United States reported that they had created a vaccine that was 100 percent effective in protecting monkeys against the Ebola virus. The results were published in a respected journal, and health officials called them exciting. The researchers said tests in people might start within two years, and a product could potentially be ready for licensing by 2010 or 2011. It never happened. The vaccine sat on a shelf. Only now, with nearly 5,000 people dead from Ebola and an epidemic raging out of control in West Africa, is the vaccine undergoing the most basic safety tests in humans. Its development stalled in part because Ebola was rare, and until now outbreaks had infected only a few hundred people at a time. But experts also acknowledge that the lack of follow-up on such a promising candidate reflects a broader failure to produce medicines and vaccines for diseases that afflict poor countries. Most drug companies have resisted spending the enormous sums needed to develop products useful mostly to poor countries with little ability to pay for them. Now, as the growing epidemic devastates West Africa and is seen as a potential threat to other regions as well, governments and aid groups have begun to open their wallets. A flurry of research to test drugs and vaccines is underway, with clinical trials starting for several candidates, including the vaccine produced nearly a decade ago. With no vaccines or proven drugs currently available, the stepped up efforts are a desperate measure to stop a disease that has defied traditional means of containing it. Dr. James E. Crowe Jr., director of a vaccine research center at Vanderbilt University, said that academic researchers who develop a prototype drug or vaccine that works in animals often encountered a “biotech valley of death” in which no drug company would help them cross the finish line. Up to that point, the research may have cost a few million dollars, but tests in humans and scaling up production can cost hundreds of millions, and bringing a new vaccine all the way to market typically costs $1 billion to $1.5 billion, Crowe said. “Who’s going to pay for that?” he asked. “People invest in order to get money back,” Crowe added. The Ebola vaccine on which Geisbert collaborated is made from another virus, vesicular stomatitis virus, which causes a mouth disease in cattle but rarely infects people. It had already been used successfully in making other vaccines. The researchers altered VSV by removing one of its genes — rendering the virus harmless — and inserting a gene from Ebola. The transplanted gene forces VSV to sprout Ebola proteins on its surface. The proteins cannot cause illness, but they provoke an immune response that in monkeys, considered a good surrogate for humans, fought off the disease. The vaccine was actually produced, in Winnipeg by the Public Health Agency of Canada. The Canadian government patented it, and 800 to 1,000 vials of the vaccine were produced. In 2010, it licensed the vaccine, known as VSV-EBOV, to NewLink Genetics, in Ames, Iowa. The Canadian government donated the existing vials to the World Health Organization, and safety tests of the vaccine in healthy volunteers have already begun. 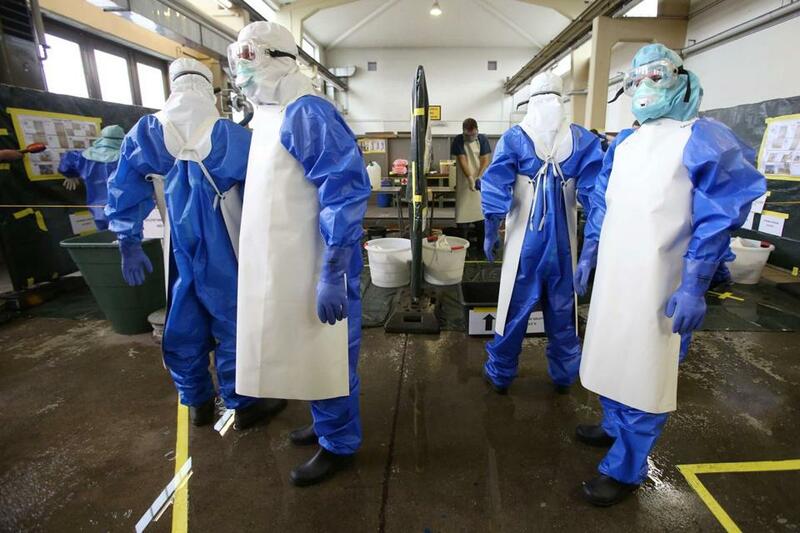 Bina Venkataraman: Why weren’t we better prepared for Ebola? Can states really quarantine anyone they want? Why do some die of Ebola, while others survive?